Thought you couldn’t have Chocolate Milk anymore because you’re KETO? Think again!! This KETO Chocolate Milk is gonna be the best Chocolate Milk you’ve ever tasted. 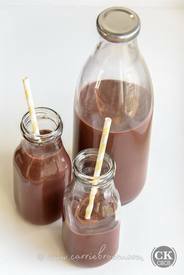 Not only can you mix up a glass to have right now, but there is a recipe for a batch of chocolate syrup from The real Carrie Brown that you can make ahead and keep in the fridge so you can get a glass of Instant Chocolate Milk, well, instantly.